How Many Calories Are in Grilled or Baked Salmon Steak? Grilling and baking are both excellent cooking methods for salmon -- and much healthier than frying your fish. 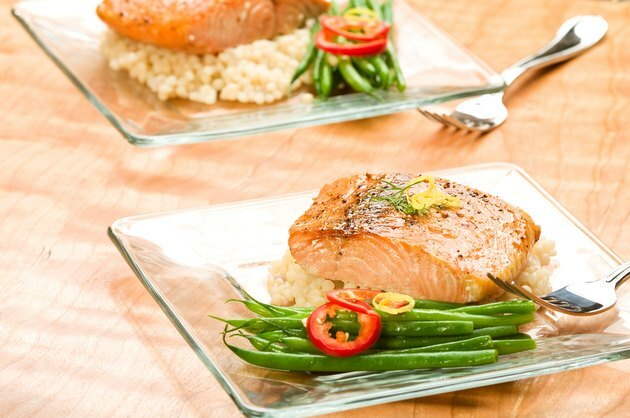 Salmon has a delicate, yet rich flavor and contains essential fatty acids as well as protein and other nutrients. If you're watching your calories, grilling or baking salmon are low-calorie cooking methods. One of the major benefits of grilling and baking is that you don't need to add oil for either, so go ahead and fire up your grill or oven. By itself, a 3-ounce portion of salmon contains approximately 144 calories, and a 6-ounce portion contains slightly less than 287 calories. (See Ref 1) So even if you go for the larger portion, you're still doing OK in the calorie department. To keep the calories low, marinate the salmon for a few hours in a blend of fresh lemon juice and your favorite herbs such as dill, tarragon and garlic. If you like, you can add olive oil to your marinade -- 1 tablespoon contains about 119 calories. If you can't imagine having salmon without a buttery flavor, add a buttery alternative spread that's free of hydrogenated oils and low in saturated fat to the marinade. Keep in mind that 1 tablespoon of a typical butter alternative spread contains 80 calories.